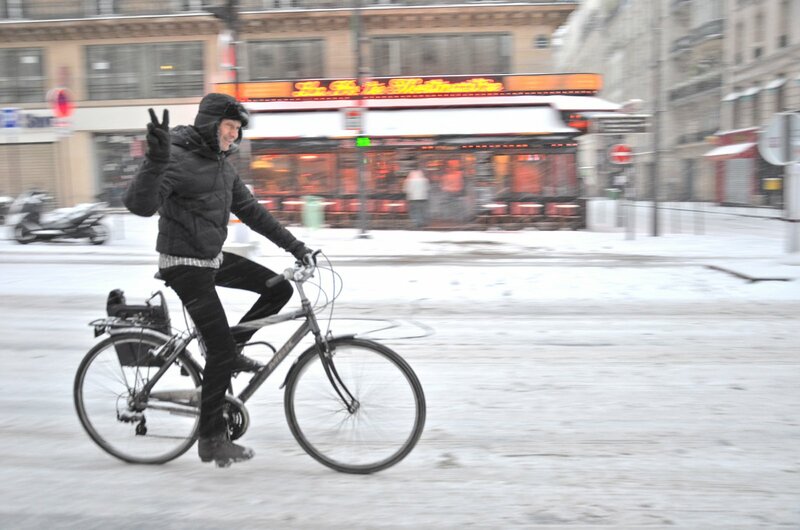 The Northern part of France and many countries in Northern Europe suffered a huge snow storm today! In Paris in snowed all day long, causing trouble in train stations, airports and in the streets. I personally love it, but that's because it gives a certain atmosphere to the city, leading people to behave with a much more friendly attitude than usual. Hence this cyclist who obviously was happy to be photographed! On a different note, I really want to thank you all for your very nice comments after yesterday's post. Thank YOU for being such true visitors - and Paris lovers ;-). Update: make sure you have a look at this litlle ski at Montmartre video! I've heard it's snow all over Europe at the moment! Funny pic! Yes, it was bad in England and VERY bad in Germany (but they're more used to having snow). I knew something must be going on with the weather when Flight AF 66 arrived in Los Angeles around 6 pm instead of 2 pm. I hope it is the last bit for winter. Wow, that's a cunning way of deducting things! Yes, it's probably the last very cold "episode" as we call it here! I heard about your snowstorm. Yikes! It's like Paris is in...Minnesota! Now that is a bizarre thought. However, you actually are farther north than we are in Minneapolis: by 4 degrees of latitude. Who would guess? Paris is about 48 degrees, and the U.S./Canadian border is the 49th parallel. Interesting. Had I participated in a game show I would have never given this answer! More snow? It's been a long winter in many parts of the world, hasn't it? But at least the guy on the bike is smiling. How could I have missed commenting yesterday? Work, work, work—so let me say today that you are my hero and I love the new look. And I'm glad the snow made everyone happy, including you and your willing subject! Gidday from 40 degrees Celsius in country New South Wales, Australia!!!!! I can vouch that this kind of weather makes everyone cranky! I love your new look blog Eric-very suave.Thanks for always posting a photo-I admire your energy and determination. I also LOVE reading it daily. I have a favour to ask-if you are anywhere near Notre Dame De Paris when the bells ring out for the first time ( March 23rd) could you get a soundbite of it? or any time after? They will be ringing hourly I believe. Notre Dame is one of my favourite places in Paris and I am so disappointed at not being there to hear the new bells. thanks Eric. Bonne journee. That is sweet Julie. Merci. OK, I've just made a note in my agenda. Not sure I'll be able to go there when they ring, but I'll try. I've seen them when they were down in the main aisle and they are quite something I must say. ANd good luck with the heat BTW! Dommage I could not respond, le travail. . . salutations! Keep doing what you're doing SVP, j'adore. In Sud Af, pleuvoir des cordes . . . et alors, I have a snowplough to swop you for your umbrella ha-ha, bon courage. Take good care of you, love to my pretty PARIS.
" In Sud Af, pleuvoir des cordes ' NOT cool! It's autumn down there right? LOLOLOL Snow. I love seeing how others that don't get much snow deal with it. (We can get that much when we run into a coffee shop to get a cup to go!) I hope you survived without incident and you enjoyed your time in the snow! We winter cyclists are generally very tough people. As proven here! Is that so? Do you ride a bicycle Stefan?? Wow! First day of viewing your new format. I'm very impressed with the new look and look forward especially to larger font and larger pictures. We haven't had a snow event in Hot 'Lanta this winter--in fact, the first signs of Spring are springing, i.e., azalea blossoms, daffodils, birds are doing new-nest things, and weather will be in low 70's by the weekend. Come on down! I LOVE the new look -- now I can really see all the details of your wonderful photos. Thank you!